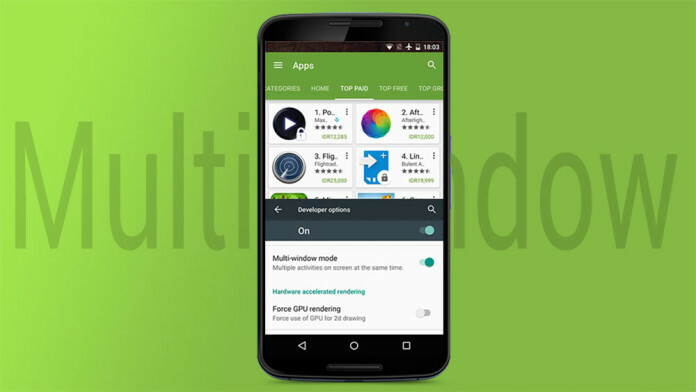 Google released Android Marshmallow with some new features and improved user interface, but there is a new feature wasn’t announced in the keynote it’s multi-window mode. Finally multi-window feature will be on stock Android build and it should arrive to all devices which will update to Android Marshmallow. To get multi-window mode working you need to modify the build.prop system file to show up the feature settings in developer options. Download and install “ES File Explorer” App on your rooted Nexus phone, root your device on Android Marshmallow. Open “ES File Explorer” and press on the top left icon. Press Tools then choose Root Explorer. Once you press OK SuperSU will ask for root permission hit GRANT. Press the top left icon, hit Local then choose / Device. .Now open “build.prop” file as text in “ES Note Editor”. Press on the top right icon (3 dot) and choose Edit. Hit the back button then press Yes to save the file. Reboot your device to apply the changes. Go to the developer options, enable developer options by going to: Settings > About phone, tap Build number 6 times until you see “You are now a developer” hit back button to go to the main screen of settings, now you will see a new option “Developer Options” open it. Scroll down to “Drawing” category. You will find multi-window mode enable it. 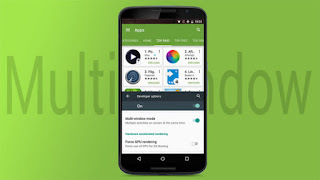 How to use multi-window feature on Android Marshmallow 6.0? Press multi tasking button a new button will appear on the top of every opened App. Tap the icon and select the layout (window up, windows down, full screen).